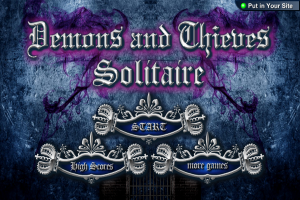 "A solitaire variant being a combination of two other ones"
The freeware game you can download here is called Demons and Thieves Solitaire. The solitaire card game fans among you might be interested in another variant of this popular game. Now, Demons and Thieves Solitaire is a particular crossover of two other solitaire variants, namely the Forty Thieves Solitaire and Demon Solitaire. The latter is also known as Canfield Solitaire and has been presented elsewhere on Winportal in detail. Without entering into a detailed explanation of the particularities concerning the Demons and Thieves Solitaire variant’s gameplay, we can say it will put your ability to organise to a test. Hence, it might be just the challenging variant die-hard solitaire players among you have been looking for, but of course, anyone interested can consider proceeding to the free download offered here.